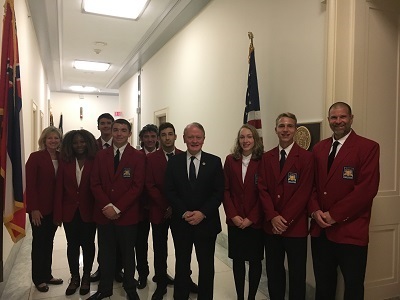 A delegation of Warren Tech students recently traveled to Washington, DC as part of SKILLS USA's Washington Leadership Training Institute (WLTI) and met with Representative Leonard Lance. As part of the experience students learned how to effectively communicate with their legislative representatives. Congressional visits are an important part of Skills USA’s Washington Leadership Training Institute. The delegation also paid respects at the Tomb of the Unknowns and the Pentagon 9-11 Memorial. 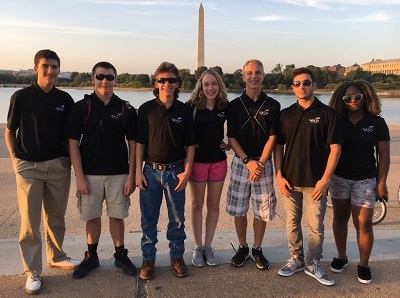 The five-day Washington Leadership Training Institute is sponsored each year by SkillsUSA to provide students an opportunity to learn about Washington D.C. and how to effectively communicate with their legislative representatives. This year’s delegations discussed the value of public career and technical education to their respective states, their career majors, their occupational plans, and the benefits of participation in SkillsUSA. The students explained that today’s workplace requires people with to participate in high-quality systems. SkillsUSA has been successful in developing these skills in students of all ages and backgrounds. The Washington Leadership Training Institute is a leadership and citizenship training event. WLTI concentrates on advanced leadership and communications skills, including sharing their personal stories with legislative representatives. This year, 506 students and instructors from 29 states attended the leadership conference. The students were accompanied by their SkillsUSA advisors Ray Gara and Lori Miller. SkillsUSA is an integral part of public career and technical education (CTE) and CTE is learning that works for America. According to the U.S. Department of Education, the average high school graduation rate for students concentrating in CTE programs is 90.18% compared to an average national freshman graduation rate of 80%. CTE is also about jobs -- good middle-class jobs -- that are essential for the American economy and global competitiveness. Experts project 47 million job openings in the decade ending 2018. One-third will require an associate's degree or certificate and nearly all will require real-world skills that can be mastered through CTE.About SkillsUSASkillsUSA is a vital solution to the growing U.S. skills gap. This nonprofit partnership of students, instructors and industry ensures America has the skilled workforce it needs to stay competitive. Founded in 1965 and endorsed by the U.S. Department of Education, the association serves more than 300,000 member students and instructors each year in middle schools, high schools and colleges. This diverse talent pipeline covers 130 trade, technical and skilled service occupations, the majority STEM-related. More than 600 corporations, trade associations, businesses and labor unions actively support SkillsUSA at the national level. SkillsUSA programs are integrated into career and technical education through a framework of personal, workplace and technical skills grounded in academics. Local, state and national championships designed and judged by industry, set relevant standards for career and technical education and provide needed recognition to its students. SkillsUSA also offers technical skill assessments and other workplace credentials. For more information, go to: www.SkillsUSA.org.